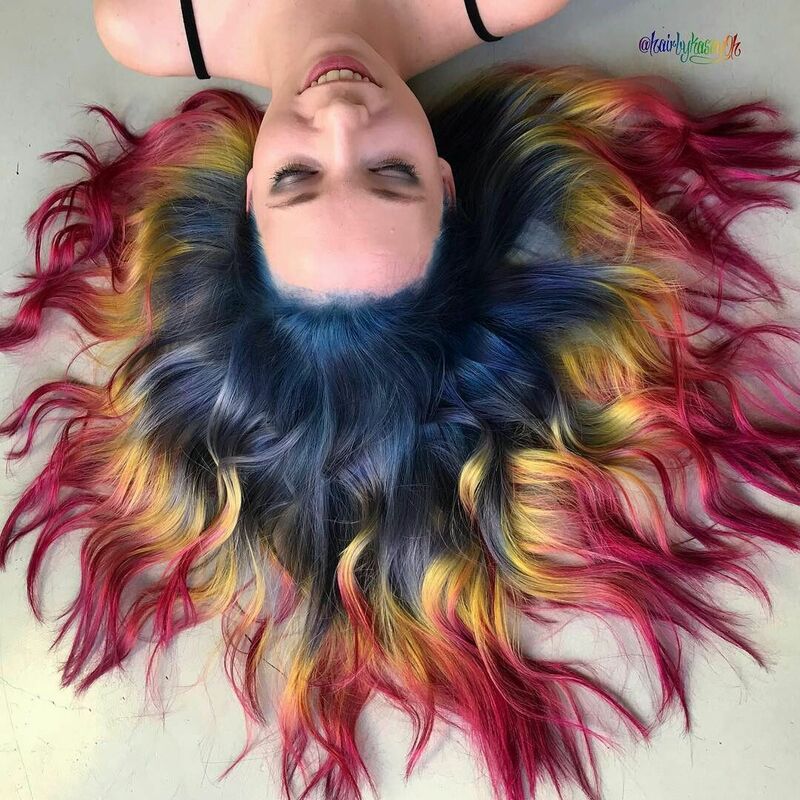 Aside from clothing, bags, and shoes, there’s a new trend for women all over the world that most are dying to try - rainbow hairstyles. No matter what the season is - this new rainbow hair trend is conquering the world by storm. Just look at those celebrities all over the world. From Maisie Williams to Cardi B to Lady Gaga, you will surely love these vibrant hairstyles. Oh, have you seen Salma Hayek? She’s rockin’ it at 52. Whether you’ve tried it before or you want to join the bandwagon, here are some rainbow color hair ideas you need to try right now. If you are a party animal, this one is for you. Wow your friends on your next girls night with bright and neon hair extensions. Neon green, orange, and pink remain to be the most popular color options. Want to make it even more exciting? Mix it up. Perfect for adventurous men and women with long or short hair. Add depth to your hairstyle by using different shades of one color. Have you seen Hailey Baldwin’s locks? Perfect, right? People are loving the amazing shades of blue. And let’s not get started on the wonderful shades of pinks and greens. Go give it a try. If you love to keep it sweet, then go for pastel colors. Keep your colors mild yet classy. Sweet hues will surely complete your winter or autumn look. Don’t forget your favorite hat! You will surely look stunning! Love rocking those tie-dye shirts and shorts? Why not rock them in your locks instead? 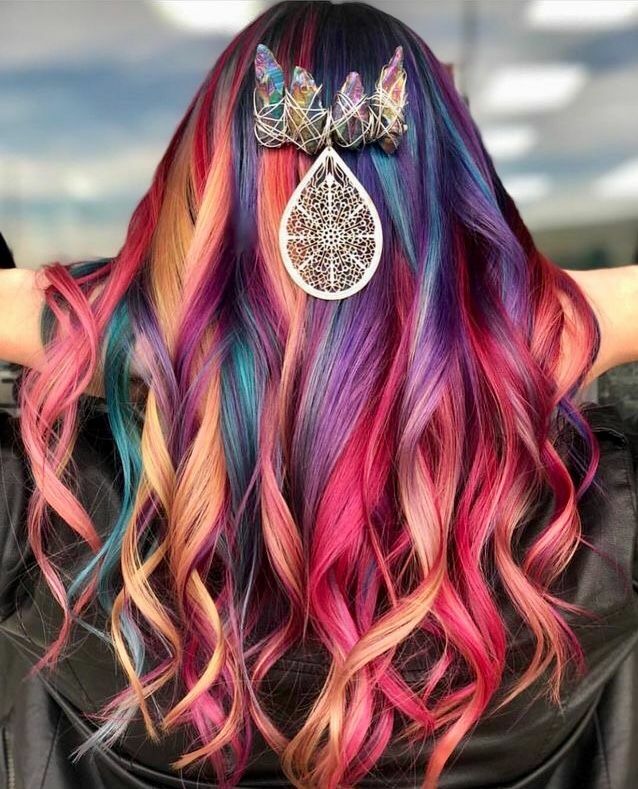 Yes, you can also enjoy this fabulous and colorful hairstyle. Perfect for men and women with short hair! It will eventually grow out and the effect will look absolutely gorgeous. If you love the idea but still want it to be discreet, then go for dark colors. Choose a shade of blue and purple and you will love the galaxy-like combination. Looking for a more adventurous look? Then, try out the rainbow hair color on shaved styles. Go crazy and go for the wild colors. You don’t always have to color your full head. Sometimes, less is more. Go for a touch of rainbow. Color your bangs or the edge of your hair. Red and orange will definitely make you look feisty. This rainbow hairstyle is one of the most popular trends. Basically, the rainbow colors are hidden on the back of your hair - colors peeking through your natural hair color. If you’re like most women who dream of being a mermaid, then maybe you should try this style. Go for mermaid style hair and use vibrant colors of pink, purple, and blue. Mix them all together and voila, all you need is a mermaid tail. Still can’t decide but want to give rainbow a try? Go for primary colors. Rock it with a neutral colored outfit and you’ll surely steal the show. Again, you can rock your rainbow locks without having it in your full head. Just go for awesome highlights. Striking bright colors of yellow, green, orange, or even pink will surely make you stand out. Tired of the old and boring gray hair? Add a bright and striking sunflower yellow! Summer is almost here. This look is just perfect! Hide your colors under your natural shade. Whether you’re a brunette, a blonde, or a red-head, this style is perfect. Show them off by rocking a pony! Channel your inner fairy and rock out that pixie look! If Tinkerbell could choose, she would definitely rock all those rainbow colors! Choose fun and vibrant colors to make sure your look will stand out. Have you seen grannies rocking out their rainbow locks? Oh yes, they do. After all, who says beauty has age! And there you have it, some awesome rainbow hairstyle ideas that you should definitely try now. These are just some of the most popular ideas. You can unleash your creativity and go for colors and styles anyone haven’t seen before. Go bold or go discreet. There are no rules, really. Who knows? You can be the next rainbow hairstyle trendsetter. In fashion, trend, and life in general, just do you. Enjoy what you love and don’t let anyone stop you. You can rock any hair color, hairstyle , and even hair extensions for that matter. What rainbow hair color style listed above is your favorite? Do you love a different style that is not on the list? Share some love and drop your answer on the comment section below.